Get ready for some serious cabin envy. 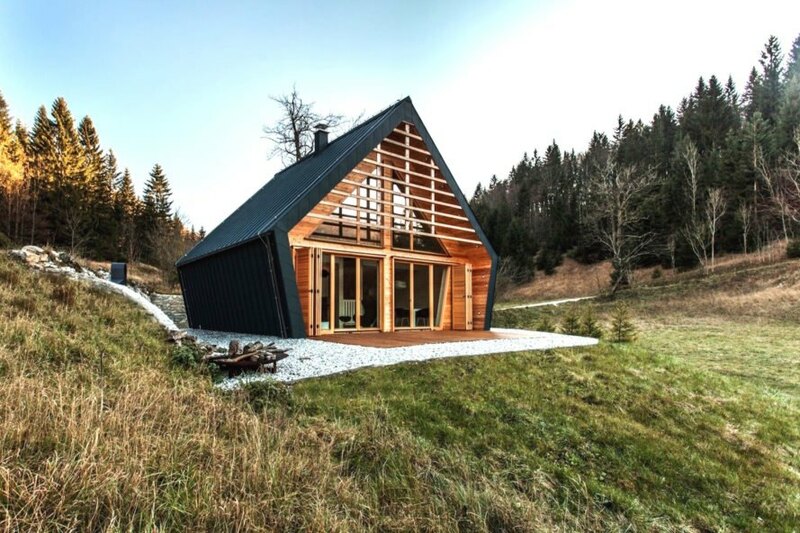 Architecture firm studio PIKAPLUS crafted a gorgeous tiny home that perfectly harmonizes with its surrounding forested wilderness. 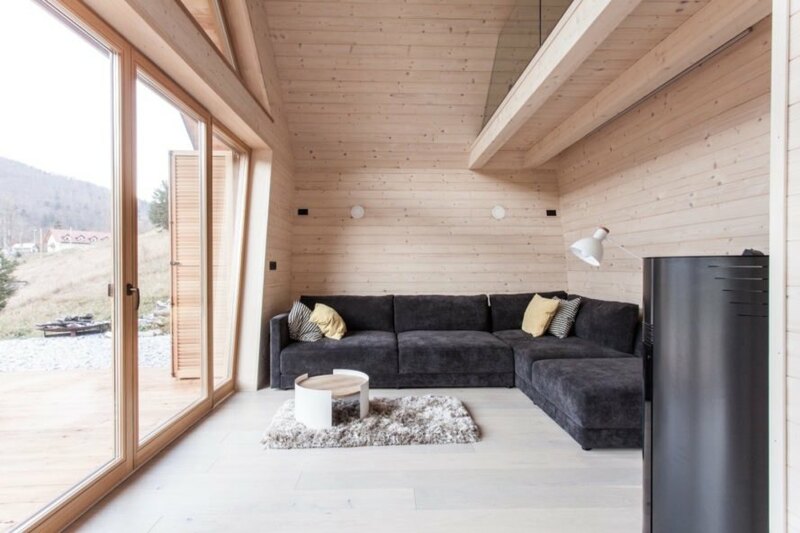 Built mostly of timber, the Wooden House is a cozy retreat for those who crave connection with the outdoors and also want simple luxuries and protection from the elements. Keep reading for a tour of the cabin’s light-filled interior. With just 82 square meters of space, the compact cabin is the result of thoughtful planning and building constraints on a small plot of land. Set on the edge of a large forest clearing, the tiny home minimizes disruption to the stunning landscape with its simple appearance and wooden construction. The landscaping around the home also respects the natural environment. The sharply pitched roof and angled side walls give the home an eye-catching appearance but run the risk of creating a cramped interior. To make the compact home feel as spacious as possible, the architects lined the walls with untreated timber that reflect the natural light that pours through the large windows. The giant glass facade brings views of the outdoors into every room of the house, with the exception of the bathroom. 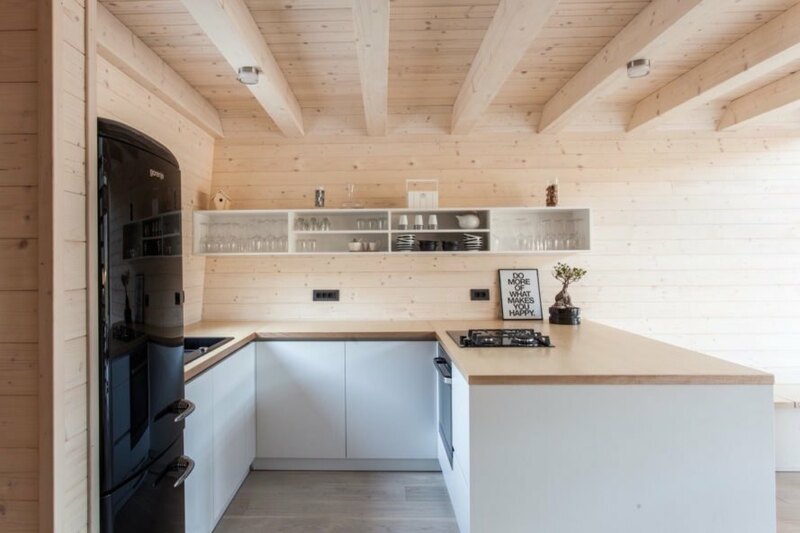 “Simplicity in the design of The Wooden House is complemented by the oblique lateral facade, adding captivating nuances,” wrote the architects. The main entrance opens up to a double-height foyer with the living room on the left and the open-plan dining room and the kitchen to the right. A bathroom and sauna are tucked in the rear. Two bedrooms are located upstairs and overlook the ground floor. 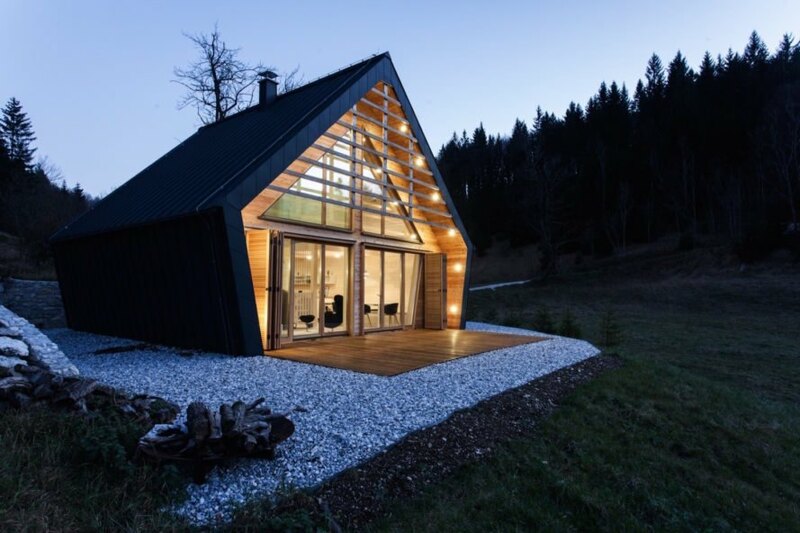 The project placed second nationally in 2016 for the best wooden construction in Slovenia. With just 82 square meters of space, the compact cabin is the result of thoughtful planning and building constraints on a small plot of land. 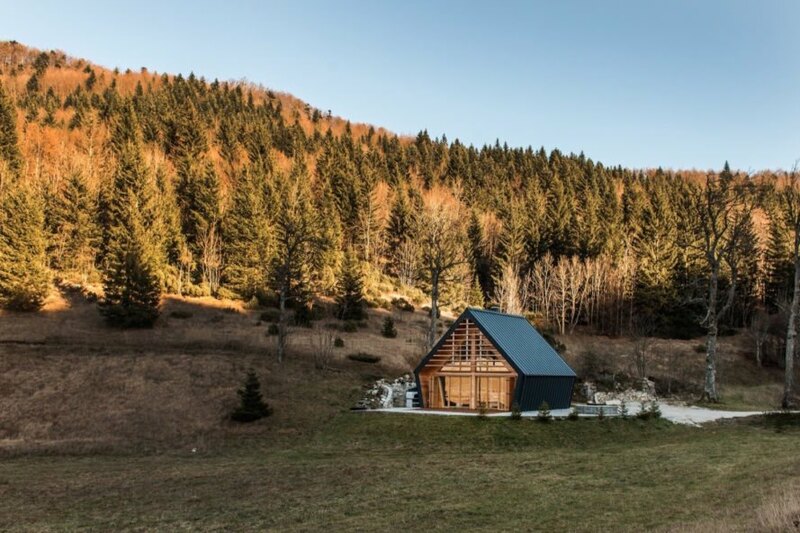 Set on the edge of a large forest clearing, the tiny home minimizes disruption to the stunning landscape with its simple appearance and wooden construction. The landscaping around the home also respects the natural environment. The sharply pitched roof and angled side walls give the home an eye-catching appearance but run the risk of creating a cramped interior. The giant glass facade brings views of the outdoors into every room of the house, with the exception of the bathroom. 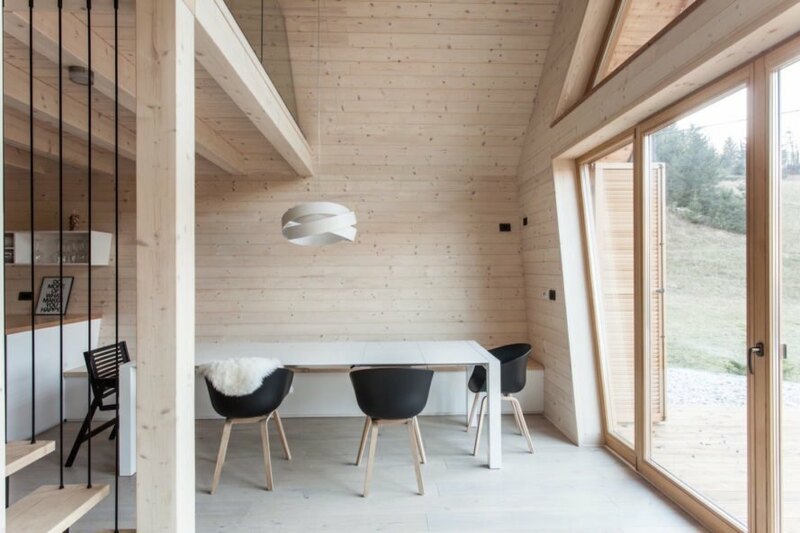 “Simplicity in the design of The Wooden House is complemented by the oblique lateral facade, adding captivating nuances,” wrote the architects. The main entrance opens up to a double-height foyer with the living room on the left and the open-plan dining room and the kitchen to the right. A bathroom and sauna are tucked in the rear. Two bedrooms are located upstairs and overlook the ground floor. 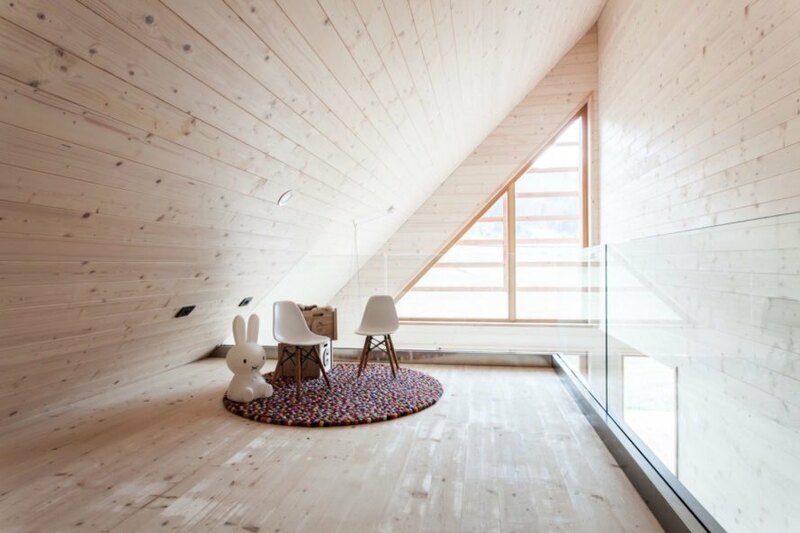 The project placed second nationally in 2016 for the best wooden construction in Slovenia.